The Phoenix Mars Lander’s robotic arm hit the planet in the field for the first time on Saturday. The effort, which has seven days after the lander touched down, is part of NASA‘s efforts to ball specimens red planet for experiments on the lander. A giant “footprint” was left behind by the robotic arm of contact in the King of Hearts zone Mars. The mark, which was captured by the camera on the lander, looks like it could have been made by mythology Himalayas snowman. In reference to this, NASA has named the impression zone “Yeti“. 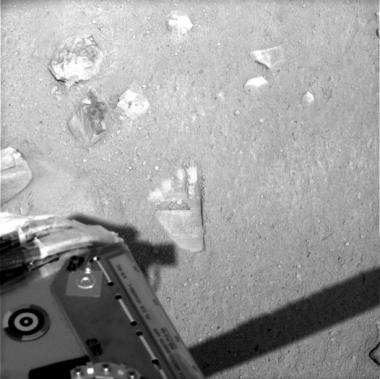 The lander, the camera has also taken other images of the area under the lander, which has been dubbed the “Snow Queen”. Images of the “Snow Queen” support site more NASA scientists assumptions that the region in and around the lander is composed of ice, according to a statement by Uwe Keller, the robotic arm of the device Research lead of the Max Planck Institute for research on solar systems. NASA photos of this last event in Phoenix also offers a more philosophical reflection on the future of space exploration. Man of the first “footprint” in Mars was made by a robot slipping, not a step in humans. You are currently browsing the archives for the robotic arm category.